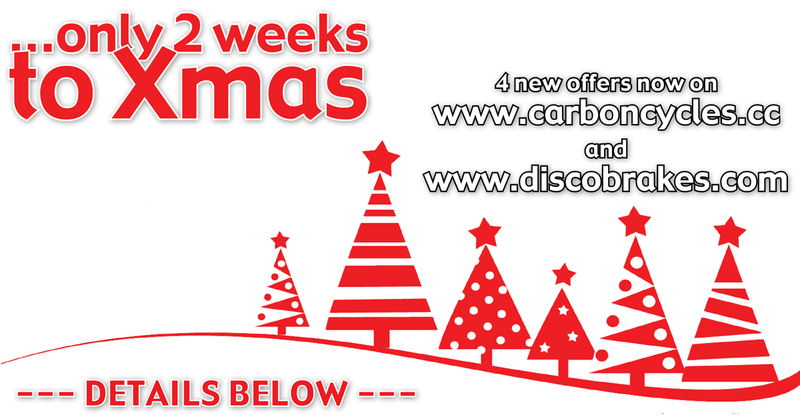 We are getting closer and closer to Xmas which means a new set of 4 different offers giving you the chance for another bargain with ‘just 2 weeks to go till Xmas’. The offer will run from the 14th December. See T&C’s below. Please use voucher code XMAS103 at checkout to receive our Xmas discounts. • Vouchers can only be redeemed on www.discobrakes.com (for Discobrakes promotions) and www.carboncycles.cc (for Carboncycles promotions). • Only one voucher per order. • Minimum spend required (exclusive of any shipping costs). • Discobrakes and Carboncycles reserve the right to end promotions at any time. • Discount vouchers & promotions are only redeemable against in-stock items. • Orders for out of stock items cannot be accepted. • Discount vouchers/promotions cannot be used in conjunction with any other voucher offer. • These codes are single use per account. • Discount vouchers/promotions cannot be applied retrospectively.